To read u&i, Cassandra Smith’s frustratingly gorgeous and gorgeously frustrating full-length collection of poetry, is to be immersed in an experience that changes you. I began reading for answers; by the end of the collection, I gained not answers but a deeper appreciation of questions themselves. u&i is the perfect example of a work of art that takes full advantage of the traditions, freedoms, and limitations of the medium – a fact that is of little surprise, as Smith herself is a visual artist whose work in collage and bookmaking elegantly stretches the boundaries of what can be considered static and kinetic art. 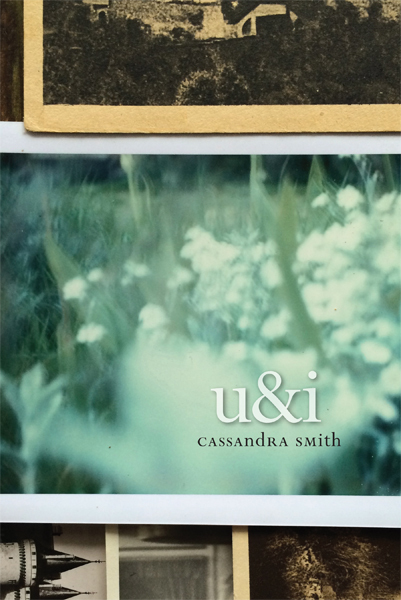 In u&i, Smith presents a cycle of prose poems that move recursively through meanings and meditations on identity. This is largely achieved through Smith’s master manipulation of one of the most intriguing facets not just of poetry but of language itself: the slippery nature of pronouns. In his essay “The Lyric: Problems of Definition,” Werner Wolf explores the complex and oft-confounding nature of pronouns – namely “I” and “you” – in lyric poetry. Wolf suggests that the lyric voice, long been perceived by readers, theorists, and critics as monologic, is more reflective of dialogue and multiplicity. In other words, the “I” and “you” in a lyric poem, to paraphrase Whitman, is contradictory, is large, and contains multitudes. u&i would be we when we were with others and u&i would be i when u&i were alone and u&i would be you when u&i were speaking to each other and u&i would worry that every concurrence might become felled. In the end, there is only one logical solution to the equation: there is no single factor represented by u&i, no solution to this variable or to the variable of any self. The very language we use to build our worlds, to tell our selves and others what we experience in these worlds, is ultimately indefinable, slippery, and strange. This shift in meaning and identity extends to the meaning and identity of the world outside of the self, to places outside of the body: “is it a city or a country,” u&i asks, “or is it only alone.” Places aren’t just differently perceived: they are different, and radically, depending upon who is there and what their experience is. It is only through one’s experience and perception of the world that the world exists. The book is about the struggle to create a language that can contain the multitudinous experiences of identity in the world, but this idea of identity extends to the world in which one exists. Emma Bolden is the author of two full-length collections of poetry: medi(t)ations (Noctuary Press, 2016) and Maleficae (GenPop Books, 2013). She’s also the author of four chapbooks of poetry — How to Recognize a Lady (Toadlily Press); The Mariner’s Wife, (Finishing Line Press); The Sad Epistles (Dancing Girl Press); This Is Our Hollywood (The Chapbook) – and one nonfiction chapbook – Geography V (Winged City Press). A Barthelme Prize and Spoon River Poetry Review Editor’s Prize winner, her work has appeared in The Best American Poetry and The Best Small Fictions as well as such journals as The Rumpus, Prairie Schooner, Conduit, and Copper Nickel.